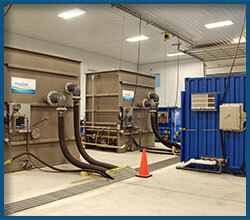 Aqua-Aerobic Systems, Inc., a manufacturing company based in Loves Park, began operations in 1969 when founder, John D. Brubaker introduced the Aqua-Jet® surface mechanical aerator to the wastewater treatment industry. Since then the company has expanded its product offerings to include more advanced treatment solutions in biological processes, filtration, membranes and process control; making it a global leader in the water and wastewater industry. 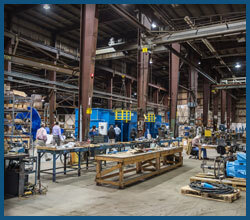 “Over the years, we’ve transitioned from a manufacturing company into an applied engineering company with about 35% of our 125 employees working in an engineering capacity,” says Cheryl Kunz, Director of Marketing. Aqua-Aerobic currently holds nearly 50 patents, and continues its commitment to advanced research and development to expand its technological expertise. The company specializes in designing commercial-sized water and wastewater treatment systems for municipalities and industrial facilities with flows ranging from 100,000 gallons per day up to millions of gallons per day. In 2011, Aqua-Aerobic Systems began a long-term partnership with the Rock River Water Reclamation District by constructing a new on-site technology center for the purpose of conducting applied research and demonstration of new products and process technologies used in the treatment of wastewater. This collaboration allows Aqua-Aerobic access to a variety of in-plant process wastewater streams from a full scale wastewater treatment plant and also serves to educate the engineering community through the company’s technical seminar program. Philanthropy is a big part of Aqua-Aerobic Systems’ corporate culture where employees are encouraged to be involved and support local organizations and charities through volunteering or serving on committees and Boards. The company has ­received several local, national and international awards over the years ranging from Illinois Export Awards to National Philanthropy Awards and several Innovative ­Technology Awards.